One of the latest casualties out of the Federal Circuit is the May 7, 2018 decision in Love Terminal Partners, L.P., and Virginia Aerospace, L.P. v. United States, No. 16-2276, authored by Judge Dyk, which reversed a decision by the U.S. Court of Federal Claims awarding over $133 million in just compensation (plus costs and attorneys fees) to Plaintiffs. 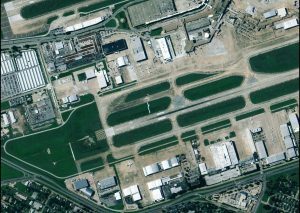 The Love Terminal Partners [LTP] case involved a privately owned renewable 40-year ground lease at Love Field (Dallas’s second airport) on which LTP constructed a $20 million passenger terminal and related facilities. In 2006, Congress enacted legislation (the Reform Act), repealing destination restrictions on Love Field flights but also requiring Dallas to reduce the number of available passenger gates to twenty. The Reform Act also partially codified a five-party agreement among the City of Dallas, the City of Fort Worth, the Dallas-Fort Worth Airport Authority, American Airlines, and Southwest Airlines, which required Dallas to demolish LTP’s terminal so that it could never again be used for air passenger service—an agreement that would have been an antitrust violation but for Congressional approval. The trial court found that the 2006 legislation thus physically destroyed and legally prohibited operation of LTP’s passenger terminal—the only economic use allowed by the ground lease. The trial court ruled that the legislation was a compensable Fifth Amendment physical taking of the terminal and a regulatory taking under Lucas (deprivation of all economically beneficial use) and Penn Central (deprivation of reasonable, investment-backed expectations, substantial economic impact and character of the government action akin to a physical taking). The trial court awarded $131.5 million in just compensation, plus interest from the date of taking, costs, and attorneys’ fees. We assume, without deciding, that plaintiffs’ theory as to the effect of the 2006 legislation is correct and that the legislation effectively barred plaintiffs from using the Lemmon Avenue Terminal for commercial air passenger service. Nevertheless, we conclude that there was no regulatory taking. Because the Federal Circuit decides nearly all inverse condemnation cases involving the United States and helps to define takings jurisprudence in general, this decision, if left to stand, will severely limit property owners’ Fifth Amendment rights in takings claims against the United States and will likely influence state courts as well. [B]etween their acquisition of the sublease in 1999 and the enactment of WARA [Reform Act] in 2006, plaintiffs suffered a net income loss of roughly $13 million. And at no point during that time, including during the period when Legend was operational, did revenue exceed plaintiffs’ carrying costs so as to meet plaintiffs’ expert’s definition for an “economically beneficial use.” Since there was no adverse economic impact, there can be no taking. Issue: Does a landowner lose the right to just compensation if their property was not productive at the time of the taking, even though the property was acquired as a long-term investment and the economic potential of the property is significant? The Federal Circuit’s holding is that the taking of investment property that has not yet yielded a profit is not compensable because there is no economic impact resulting from a taking, even if the property is worth millions of dollars due to its future potential uses and the owners acquired the property as a long-term real estate investment. Issue: Where a single government action takes one owner’s property to benefit the public as a whole, and at the same time enhances the value of someone else’s land, is the taking compensable? Here there can be no regulatory taking because plaintiffs have not demonstrated, or even attempted to demonstrate, that their ability to use their property for commercial air passenger service under the pre-WARA regulatory regime had any value. The Claims Court’s determination that WARA destroyed all economically beneficial use and value of plaintiffs’ property was entirely based on testimony from plaintiffs’ experts that the property had value, not under the regulatory regime that existed before WARA, but under a regime in which the Wright Amendment was repealed or modified. None of plaintiffs’ experts assessed the use or value of plaintiffs’ leaseholds with the Wright Amendment in effect—despite the fact that the Wright Amendment was the governing law at the time of the alleged taking and had been for over a quarter century before then. Issue: In a case involving the taking of a long-term lease, must the valuation of the lease ignore legislative changes that enhance the lease’s value after the taking? Marzulla Law represented LTP in the trial court and in the Federal Circuit. Paul Clement, of Kirkland & Ellis, will be preparing the petition for certiorari due on February 11, 2019. A decision on the petition is expected by June 2019. Love Terminal Partners v. City of Dallas, 527 F. Supp. 2d 538, 560 (N.D. Tex. 2007). Love Terminal Partners v. United States, 889 F.3d 1331, 1340-41 (Fed. Cir. 2018).